Participants must complete all 3 sessions to complete the program whether you attend the face to face program or the online program. Face to Face – In the event of being absent for an urgent/sickness reason, the participants will generally have to wait 3 sessions to attend the session missed. Just discuss with the staff and they will be able to assist with advising the next date to attend. Missing a session does not affect your attendance at our program. Please note that from the start date, you have 6 months to complete our program. Participants may elect to return to the Court without completing the course. Face to Face program – Participants must arrive 15 minutes before any session (by 6:45pm) to enable enough time to sign in each night. Session starts 7:00pm SHARP. Face to Face program – Participants must not turn up under the influence of any alcohol or other drug on any day they are attending the program. If they do, they will be asked to leave. Participants must display an acceptable standard of behaviour while attending the program. If a person is disruptive, security will ask that person to leave. Face to Face/Online – Participants must sign an indemnity form for insurance purposes relating to the program. Face to Face – Participants must make payment of $185.00 (incl GST) at time of booking or before commencement date. No cash is accepted. Online Program – All participants will book the online program and pay the fee of $285.00 (incl GST) through our website. Face to Face program – Don’t have an eftpos card – you can either ask someone else to call us on 0401 344 982 and make the payment on your behalf and then you give them the cash; or please bring a money order from the Post Office made payable to QTOP for $185.00 on your first night. If you are bringing a money order, please advise staff prior to arriving. Face to Face/Online – All participants must have photo identification to complete our program. Have no photo identification? Please call and speak to the friendly staff to assist you – you can still attend, we will discuss other arrangements with you. Face to Face/Online – Upon completing the program, all participants must complete their Homework summary sheets/Overall Feedback outlining the benefits of the program, demonstrating knowledge they have acquired from the program. Your Homework Summary sheet will be signed off by the coordinator which is then submitted to the Magistrate. 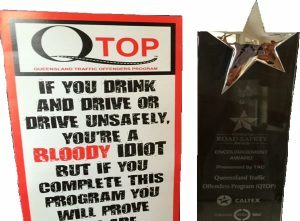 Our Australian Award Winning Professional Court recognised traffic offenders program/road safety program is a three (3) session program (one night a week). Face to face program can be completed in 1.5 weeks if you are willing to alternate between both the Nerang and Brisbane venues Please see details below for enrolment or call 0401 344 982 to speak to our friendly staff. ONLINE PROGRAM NOW AVAILABLE IF YOU CAN’T ATTEND FACE TO FACE. Fully recognised throughout Brisbane, Gold Coast & Queensland. Our well established program has been running since March 2006! Over 12 years of educating on road safety in Queensland! Change your mindset on traffic offending by attending QTOP.